Heavy snow and ice accumulation coupled by a wave of roof collapses have left residents of the Northeast rushing to remove snow before their rooftops give way. The demand is so great that snow removal tools, like roof rakes, have become winter’s version of Tickle Me Elmo, a hot commodity that once flew off of store shelves. With the threat of more snow on the horizon, state emergency officials across the region are urging people to clear their roofs and decks to minimize the likelihood of structural collapse. To prevent major damage as well as save big bucks and stress, here’s a breakdown of winter roof protection. Picturesque snow-capped houses are charming, but don’t be fooled by their delicate beauty. Snow has a great deal of weight, and that weight increases immensely when rain, ice and sleet are added to the mix. Two feet of snow on the average-sized roof can be the equivalent of 38,000 pounds, or 19 tons, NBC News reports. All of this weight puts stress on your roof and weakens its structure. Complicating matters more, the melting of this mass can cause water seepage, which can rot roofs, destroy insulation, flood attics, ruin gutters, and damage the interior of your home. Before attempting to remove snow from roofs, take note that clearing roofs can be a very dangerous task. Think twice before jumping on the roof with a shovel in hand. Most officials don’t support the idea of people climbing onto their roofs to remove the buildup, as the weight of a person may be just enough to trigger the roof to collapse. Taking the wrong step on an icy roof can easily send you sliding down a slippery slope. The obvious sign that a roof is about to give way is sagging. Also, if you hear creaking, cracking, or popping sounds, you should get out of the building as quickly as possible. These are all strong indicators of an imminent collapse. According to the Providence Emergency Management Agency, severe roof leaks, bowed pipes attached at the ceilings, cracks in the walls or masonry, doors that pop open, as well as doors or windows that are difficult to open, are also signs people should look for. In addition to your roofs, take heed of decks. Often times they are DIY hacks and may not be up to coding standards. This makes them highly susceptible to collapse under the weight of the snow and ice. How Do You Remove Snow from the Roof? Once snow buildup occurs or ice dams forms, using a roof rake is the best option that doesn’t require spending cash on a professional. The rake has an extended handle, which enables you to pull snow off the roof — from the safety of the ground. To remove snow and ice, start from the edge and work your way into the roof using downward strokes. Try to to scrape the snow along the bottom of the roof, shaving two or three inches off. There’s no need to scrape the roof entirely clean, as this will risk damage to your roof shingles or other roof covering. If you don’t have a roof rake (or your local hardware store is sold out), follow these tips to create a DIY roof rake. Metal snow rakes conduct electricity if they come into contact with a power line, so be careful. Also, avoid using a ladder when removing the snow; the ladder’s rungs can freeze and cause you to slip. Instead of the ladder, buy extension poles or a longer rake to reach higher portions of the roof. While the average roof rake can be purchased for about $40, the Avalanche Snow Rake is pricier (around $120) and allows for easy removal of snow from high roofs. Get snow off the roof before it causes ice damage. 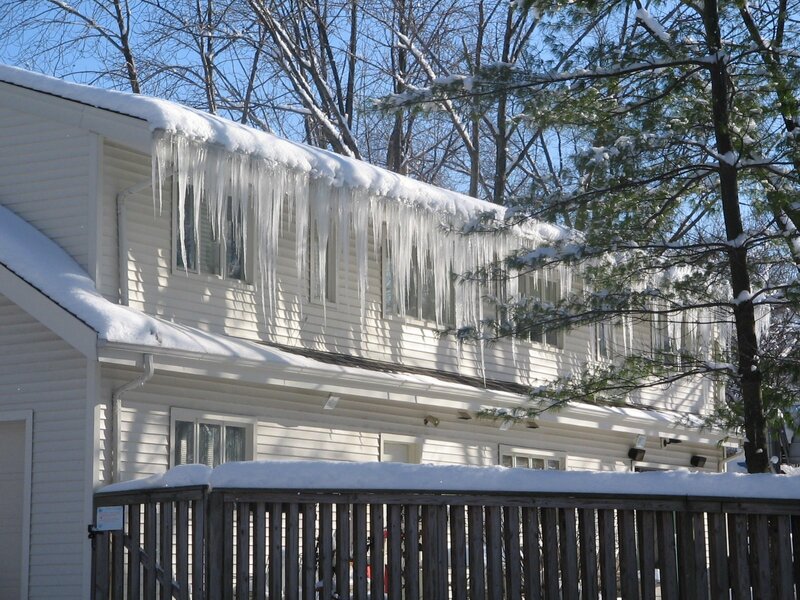 Ice dams typically form when snow on the roof starts to melt due to heat escaping from inside the home. The melted water runs down the roof, refreezes, and clogs up gutters. As more snow melts because the gutters are blocked, the water is forced to travel under the shingles and leak into the house. Be sure to add insulation to your attic floors. A well-insulated attic and well-ventilated roof will prevent heat from escaping, which in turn will protect the roof from conditions that cause ice dams. Clean your gutters bi-annually. Blocked gutters and downspouts can cause ice dams, as well as rot and other water-based damage to your home. Before the first snow falls, clean your gutters to remove leaves, twigs and other debris that have collected through the fall. Perform this task again in the spring to clean out the debris from winter. Keep gutters and drains free of ice and snow. During winter months, make sure your downspouts are cleaned at ground level. Use pantyhose for a fast fix. This Old House suggests filling the leg of a pair of pantyhose with chloride ice melter. Put the hose onto the roof so it overhangs to the gutter. The calcium chloride will melt through the snow and ice and free up a channel for water to flow down into the gutters and off the roof.